As I traverse the web-o-sphere I can't help but notice how folk leave comments on the more popular sites. Leave a comment on a site that gets 25k visitors a day, and you are bound to snag ONE visitor to your site because in some magical way, they actually ended up clicking on your website link that you embedded with your name on your incredibly insightful comment. I get it and more than likely the commentator is a new blogger who doesn't get how to properly grow their blog traffic and might be taking the easy way out. 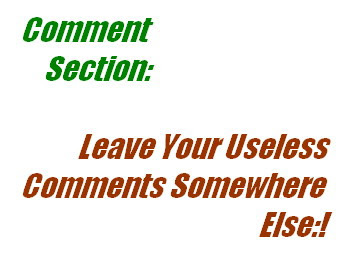 First off, be aware that the comment section in Wordpress based blogs don't contribute to your own SEO. "This is some really good info." just doesn't inspire anyone to take notice of you. In fact more than likely, this kind of comment annoys people, if they even pay attention to it. Why? because it's a reactionary, self centered type comment. It's not impressive and appears to be a blatant effort to get attention. If you want to impress people, leave comments that extend the subject matter or add depth to it. More importantly, leave your comments where people actually do interact with each other. Watch the comment patterns. Over on ProBlogger, it seems to me that people are leaving comments in the hopes of generating their own traffic. Why do I think that? Because it's rare to see the comment authors interact with each other to further the conversation. I've popped in on several posts and leave comments that are responses to previous comments and no one responds back. You can dang near insult someone but they don't take note because they've come, they've spammed, they left. It's rather disappointing and I've given up trying to ignite conversation. There are sites where the comment section is an active participation of a subject. Those are refreshing and it helps weed out the "brighter" folk. And when I mean active participation, I don't mean Digg or Topix style commentary where within half a page people are calling each other colorful names. That's not the constructive participation I'm thinking about. It's hard to find a blog where comments extend the subject with constructive conversation. ScreenRant.com is one such site. They've got tremendous depth of knowledge and the readers that visit the site often further the conversation in the comments section. Sites like that are a goldmine... if you don't spam it. Spamming is obvious. It's rude. It's the odd man out kind of feel and if it's a blatant spam, you'll find your comment left out in the dark when one of the admins catches it. Do yourself a favor. If you don't have something to add, resist. In the long run, it will help you. You'll learn to read into the conversation more critically and you will find in time that this talent will help you leave constructive comments. The kind that do catch readers attentions and will help you generate traffic.